Etiology: Females greater than 3 years of age may develop cystitis (several different bacteria have been implicated) and form cystic calculi . Urinary calculi can also occur in aged boars when congealed ejaculum forms proteinaceous urethral obstructions. Incidence: Uroliths (most commonly calcium carbonate) occur commonly. Clinical Signs: Anorexia, hematuria, dysuria and hunched posture may be noted. Pathology: Urinary bladder mucosal hemorrhage or congestion and calculi which adhere to the urinary bladder wall may be appreciated grossly (A.). Diagnosis: Diagnosis is made based on clinical signs and radiography. 2. 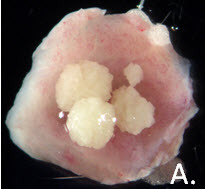 Hawkins, M.G., et al., Composition and characteristics of urinary calculi from guinea pigs. J Am Vet Med Assoc, 2009. 234(2): p. 214-20.